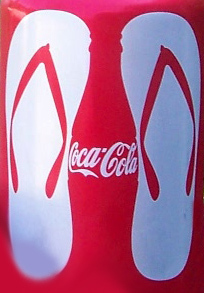 I have just found this illusory coca-cola can showcased on Deceptology blog. It works in a way where empty space between two slippers forms a globally recognizable bottle shape (logo). Very similar ad was already featured by Cola for their Zero line of caffeine drinks. Dunno if you can recall us featuring it in the past. coca-cola sure gives an nice way to present their trademark bottles. When I first saw that on a can and figured it out it reminded me of this site! I didn’t see the bottle until I read what you said, I was wondering what was illusory. I love getting the daily illusions, thanks. Yay sandals and a bottle. It’s a modern classic, if you get what I mean. Yeah good. It soes it’s job and reminnds us all of summer. Nice can, err bottle, but it’s a can…no it’s a bottle! Dangit….im lost! They always *ok usually) have such nice simplistic logos that just grab you. You must be from hawaii cause that’s what we call them, slippers. Never flip flops. We call then flip-flops/slippers in America! It isn’t slippers, they’re thongs from Australia, (also known as flip-flops in UK). I saw this a month ago for Coca-Cola over here in Aus. i saw the bottle before i saw the sandals.